I blame it all on my middle daughter Mel and this photo (and of course the enablers who are the IFFF (International Freeform Forum on Ravelry). Mel is a recently graduated environmental microbiologist with an enduring scientific passion for fungi. She’s now on the long academic journey to becoming a mycologist – a fungi scientist. It’s because of her that I know that mould is essentially just microscopic fungi. When the lovely Loren in IFFF instigated a Fungus Along for October / November and put a call out for DFADs (Designers for a Day), I knew what I wanted to do. I wanted to try to write my first patterns and I wanted to do mould. As part of a project, Mel collected and cultured mould spores collected from the air in houses on petrie dishes. It’s been a long term dream to turn this photo into a knitted cushion for her. Probably a little ambitious for a DFAD gig though. So I concentrated on just one species of mould. See the little blue green colony here? That’s Penicillium – the source of the antibiotic penicillin. (And here I apologise for the Australian spelling – American spelling is mold, Australian spelling is mould). 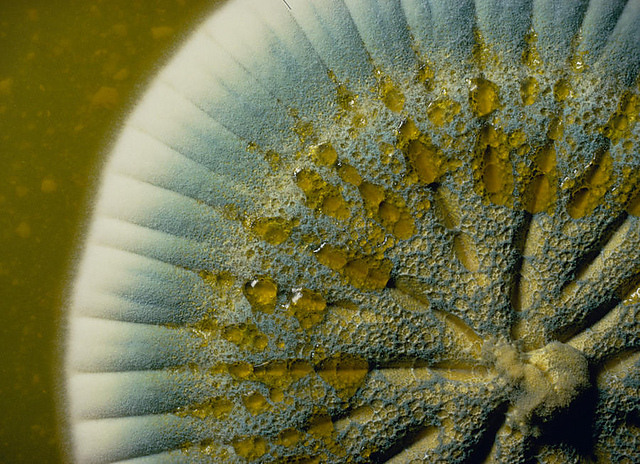 There are two species names used for the penicillium mould that penicillin the antibiotic is extracted from – Penicillium notatum is the original scientific name but more recently scientists refer to it as Penicillium chyrsogenum. To see penicillium mould’s afinity with mushroom have a look at some pictures of it under a microscope – it’s like a beautiful delicate fringe like flower. But we’re going to make amazing mould colonies. 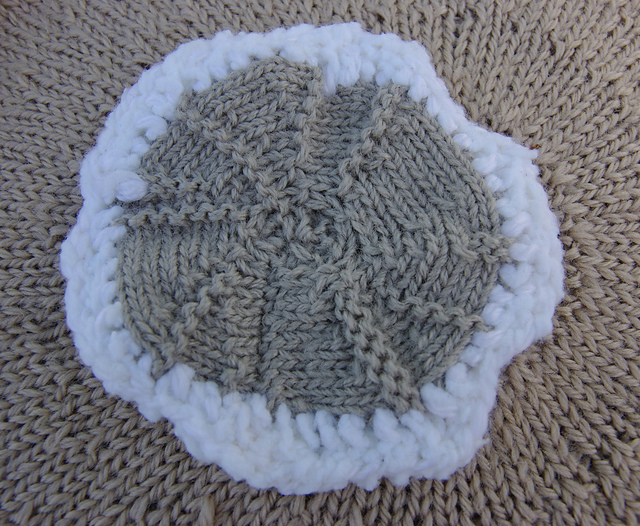 I made patterns for four penicillium moulds - two knitted flat and two crochet. Here are the pictures of the finished moulds. Firstly the inspiration photos and then the knitted / crocheted versions. 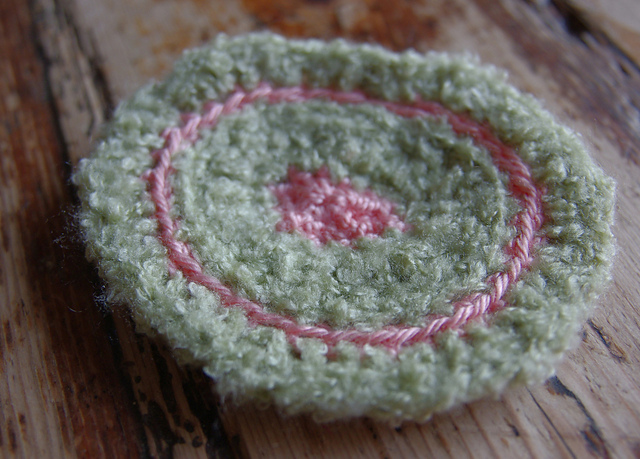 This one is knitted flat using short row shaping to make a circle with a random crochet edge. (It’s when the mould colonies start to produce spores that they become really amazing – producing bright jewel-like beads of colour). 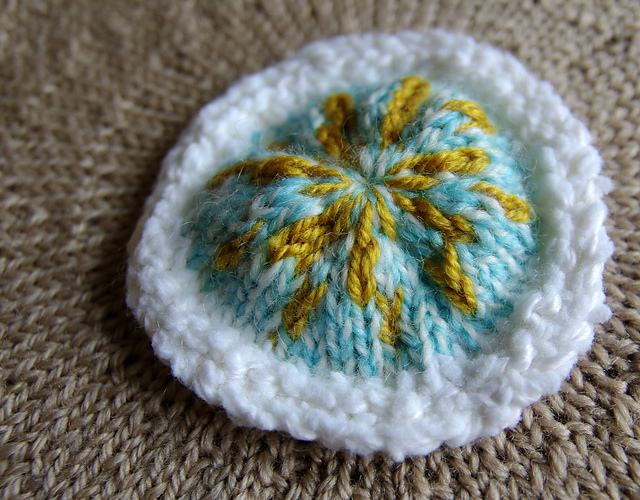 This one is also knitted flat on two needles. 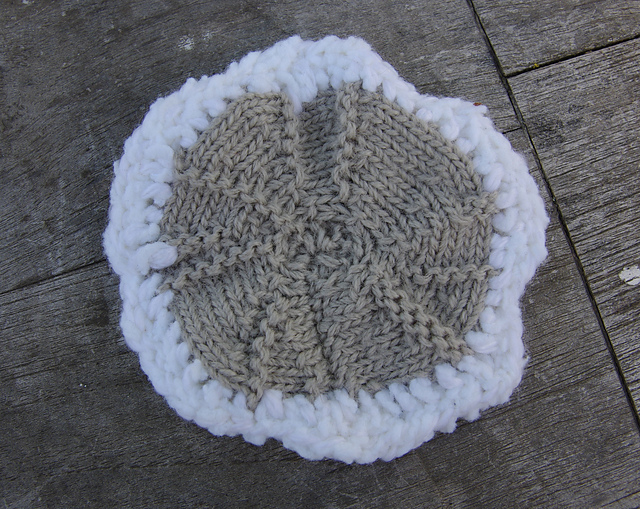 I was aiming for actual wrinkles in the knitted surface with this one and a slightly dome like circle with a flattish edge. 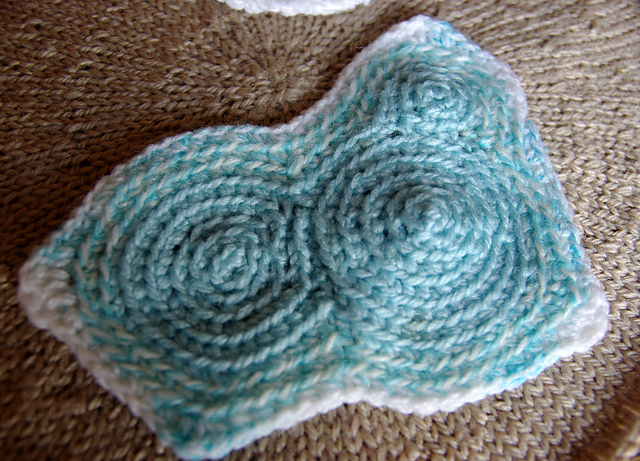 (I used acrylic yarn but I suspect you might get crisper wrinkles using something with a lot of cotton in it). 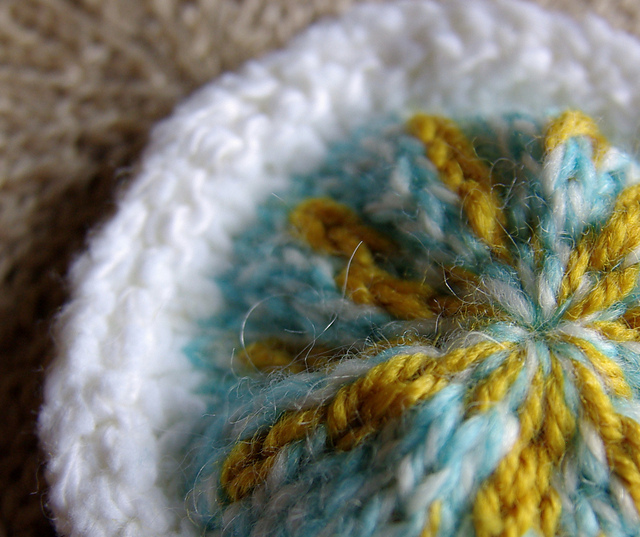 The edge yarn does need to be a heavier gauge than the center yarns or the edge will curl up. I'm not going to show you the inspiration shot for this one as it is a stock photo and sharing it on my blog would be abusing copyright. 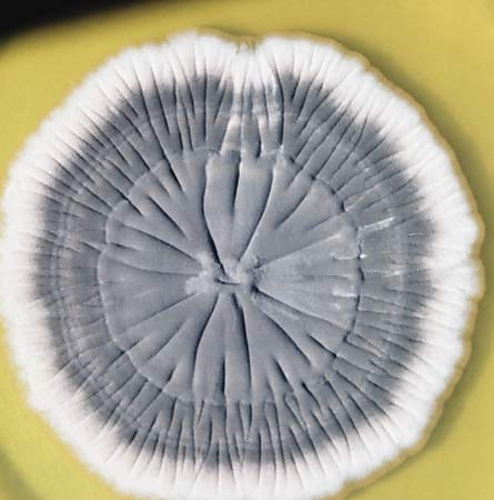 Mould grows in circular colonies that clump together with rounded edges. This is my first go at designing a crochet pattern and I admit I was really apprehensive about whether people could follow it. 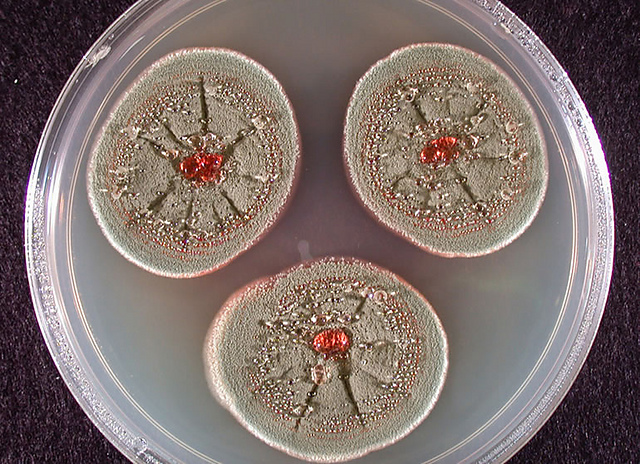 But there are three lovely mould colonies made from this pattern in the IFFF group as I write this and they are all beautiful in their own way. This could also be a contour map? 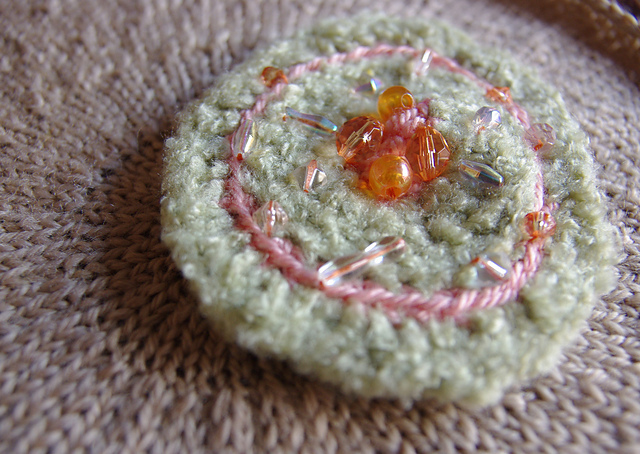 What do you get when you combine a fuzzy green yarn from the 1980s and a collection of beads? Embellished mould. This was just such a gorgeous inspiration picture I had to try to capture it in yarn.